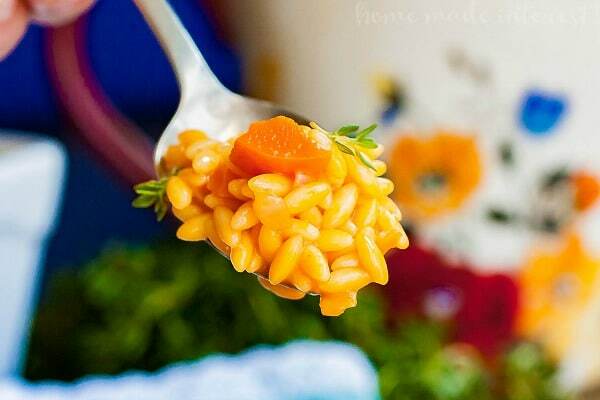 Carrot Orzo - Home. Made. Interest. 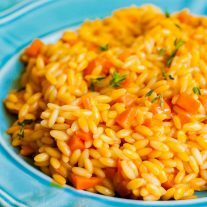 This easy Carrot Orzo is a simple side dish flavored with carrot juice and cooked like risotto for a beautiful spring dinner. Alright, time to put away the shamrocks and get ready for bunnies! This year we’re going to my sister’s house for Easter and I’m so excited about spending the day with the kids hiding Easter eggs. My sister is taking care of dessert this year and she has already started texting me with ideas. Lemon icebox pie and coconut cake are both in the running, and we might even give a carrot cake roll a try this year! Since she has dessert covered that means I get to play around with a new recipe for Easter dinner. I’m pretty excited about this carrot orzo recipe. It’s kind of like risotto but it uses orzo pasta and I love how much carrot-y flavor comes through. 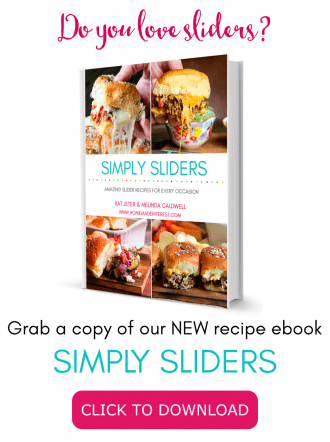 The recipe is really simple. It takes a little patience because you cook the orzo slowly with a ladle or two full of broth at a time but it is totally worth it. I wanted to keep this carrot orzo similar to risotto so I started by cooking some finely diced onions and carrots in butter and then adding the orzo and lightly toasting it in the pan. The first liquid I added was 1/2 a cup of white wine. 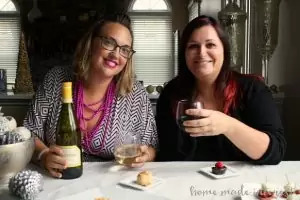 I love the flavor that adds but if you don’t want to use wine then you can just start with the carrot juice and broth mixture that comes next. That carrot juice and broth mixture is what gives this carrot orzo it’s bright, sweet, spring flavor. It’s a mixture of lemon juice, carrot juice, and chicken (or vegetable if you prefer) broth that is combined in a small saucepan and heated over low heat until it is warmed through. The warm carrot broth is added to the orzo about half a cup at a time. I have a ladle that is perfect for this so I just ladle the broth in stirring the orzo until the liquid is absorbed and then add another ladle of broth. This continues until the orzo is cooked al dente. Beautiful isn’t it? I love the rich orange color and the brightness of the lemon and carrot juice. 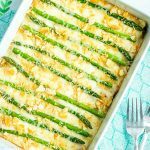 I think it will make a perfect side dish for Easter dinner! 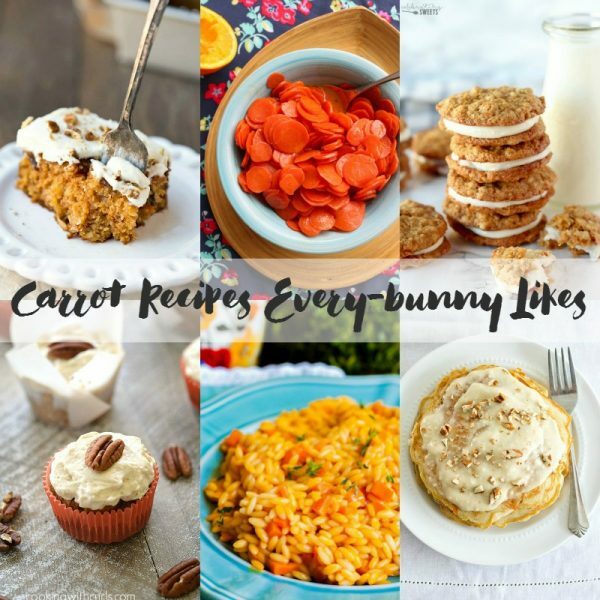 If you’re looking for a few more carrot recipes every bunny will like you’ve got to check out these recipes from a few of our favorite bloggers. 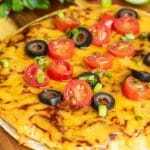 They have made everything from Carrot Cake Pancakes to Carrot Orange Punch so check out the recipes for a little more Easter dinner inspiration! 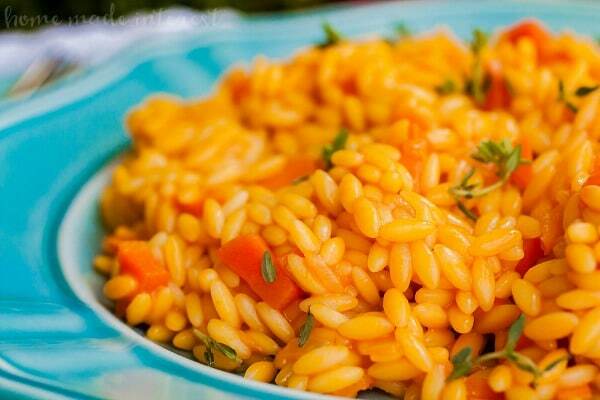 This easy carrot orzo is flavored with carrot juice and cooked like a risotto recipe using orzo pasta inside of rice. In a small saucepan combine lemon juice, carrot juice, and broth. Heat over medium low heat until warmed through. In a skillet heat over medium high heat and add butter carrots and onion. Cook for 5-7 minutes. 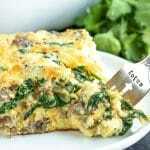 Add orzo to the mixture and stir to toast the orzo. Add 1/2 a cup of white wine to the orzo and stir until the liquid is absorbed. Begin ladling the carrot broth into the orzo a 1/2 cup at a time letting the liquid be absorbed before added the next ladle full of liquid. 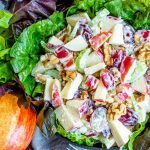 Continue doing this until the orzo is cooked through.